If you've looked at a million shawl and wrap crochet patterns and can't find the right one, check out this Elegant Crochet Flower Shawl by Kristin Omdahl. It's one of our prettiest crochet shawl patterns. 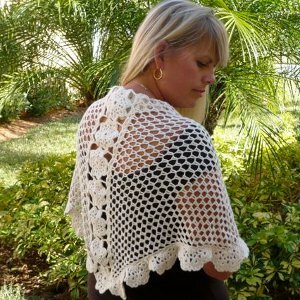 This stunning and lovely free crochet shawl pattern adds just a hint of warmth without any weight to your wardrobe. Unlike many other bulkier crochet patterns, this DIY shawl is light and lacy. Created out of your favorite light-colored yarn, you can easily add something elegant to your wardrobe. Easily paired with with a sundress in the summer or with a long-sleeved tee in the winter, this is an all-weather crochet pattern that you will want to pull on time and time again. Find even more elegantly easily crochet shawl patterns and more in our list of 19 Shawls and Wraps + An Easy Wrap Crochet Pattern. With yarn doubled, Ch 6 and sl st into 1st ch to form a ring. Round 1: ch3 (cout as 1dc), work 15 dc into ring, sl st into 3rd st of ch3 at beg of round. Round 2: ch5 (cout as 1dc and ch2), dc into same st as last sl st, *ch1, skip 1 dc, into next dc work [dc, ch2, dc]; repeat from * 6 times more, ch1, sl st into 3rd of ch5 at beg of round. Round 3: sl st into 1st ch2 sp, ch3 (count as 1dc), into next sp work [1dc, ch2, 2dc]; * ch1, into next ch2 sp work [2dc, ch2, 2dc]; repeat from * 6 times more, ch1, sl st into 3rd sp of ch3 at beg of round.repeat from * 6 times more, ch1, sl st into 3rd ch of ch3 at beg of round. Round 4: sl st into next dc and 1st ch2 sp, ch3, work 6dc into same sp as last sl st, sc into next ch sp, [7dc into next ch2 sp, 1sc into next ch sp] 7 times, sl st into 3rd of ch3 at beg of round. Fasten off. Row 3: slip st in 1st dc and ch2 sp, *(2dc, ch2, 2dc) in ch2 space, ch1* repeat from * to * 3 more times, turn. Row 4: sc in 1st st, *7dc in next ch2 sp, sc in next ch1 sp* repeat from * to * 3 more times, turn. Row 5: sc in 1st st, *ch3, skip 1 st, sc in next st* repeat from * to * across. Fasten off, leaving long tail to sew half-flower onto shawl. Sew 8 flowers together in a straight line, using 2 adjacent petals of each flower and the 2 adjacent petals on the opposite side of each flower. (see photo). Repeat from ** to ** on other side of flower panel. Note: Make sure that the flower panel and half-flowers are all facing in the same direction (RS) when sewing into place. The triangular sections are reversible. Using the photograph as your guide, sew each long side of the flower panel to a shorter side of each of the triangle sections, making sure that you choose the shorter edge of each triangle so that the longer edge will remain at the top of the shawl. Each triangle consists of two short sides and 1 long side. The long side of each triangle is each half of the top of the shawl. Each triangle has a short side that will be sewn to the flower panel, and a short side that will become the bottom “V” of the shawl. This edge is where the half-flowers will be attached. Sew each of the half-flowers along the long sides of the triangular pieces, (see photo). After the first half-flower is sewn into place, the first stitch of each remaining half-flower should be snugly sewn right next to the previously sewn half-flower. With right side facing, sc evenly along top of shawl, then reverse sc back along same edge. Fasten off. Wash, block and dry. We interviewed Kristin Omdahl on FaveCrafts Radio and asked her about this project. Listen to the April 6th show to hear her tips and tricks. I just love the patterns that Kristin designs. I always like when she appears on the crafting shows as well. I love this shawl pattern. It is so feminine and does not look very complicated. It would look nice in a shimmering yarn as well. Thank you. I know that Kristin is working on an updated version of this pattern, using her own yarn... keep checking back on this site, or her site for the file! Hmmmm, I found photos at Ravelry that show this shawl (the pattern is for sale there). Looks to me like the shawl is actually made of 4 triangle sections. Two sewn together to form each half of the shawl. This does make the long side of the triangle (which is actually 2 short sides sewn together) the bottom edge that the half flowers are sewn onto. Here's the Ravelry page with the photos http//www.favecrafts.com/Crochet-Clothes-Pa == tterns/Elegant-Crochet-Flower-Shawl Look at the top photo and you will see what I am talking about. Wish there were an edit button for comments. Looking at the triangle instructions again and the photo at Ravelry, it looks like there are just 2 triangles for this shawl, and the long edge is the bottom where the half flowers are attached. Sorry to clutter up the comments. But at least you can see the photo using the url in the above reply. It appears that the "Triangle" instructions are missing or am I mis-reading it - I started the flowers last night and LOVED them - will try the half flowers next - but final assembly says attach to triangles they are reversible .. there are no instructions for triangles ( any one help? This is one of the most poorly written patterns I have ever seen! Does anyone know where I can find this pattern charted? Thanks. Doy you use just one strand of yarn for the sides? It says double on the flowers, but not for the sides, so assume they are one strand. Okay, I've got it crocheted & now to put it together!!! I can't see totally from the picture to tell how to piece it together. And sewing it together instead of crocheting it; is not right. I have a row of flowers, 19 half flowers & 2 pieces of something to put where? It's not written properly for anyone to follow. I don't recommend this to anyone. If there were pics to see how to put it together, it might then be an Elegant Flower Shawl. Right now it's just yarn crocheted for nothing. It says in the instructions: sew each long side of the flower panel to a shorter side of each of the triangle sections, making sure that you choose the shorter edge of each triangle so that the longer edge will remain at the top of the shawl. Each triangle consists of two short sides and 1 long side. The long side of each triangle is each half of the top of the shawl. Each triangle has a short side that will be sewn to the flower panel, and a short side that will become the bottom V of the shawl. This edge is where the half-flowers will be attached. So let me re-word this for you. You have two triangles. They have two short sides and a long side. Now place them so that the long sides are horizontal, on top. Then bring the two triangles close, to form a bigger triangle (forget about the flowers for now). Do you see how the shawl will be? The top long line and the point which is pointing towards you. Are we good up to here? If we wanted a plain shawl, without decorations, we could sew it as it looks now. But as we want decorations, we will slightly separate the two triangles to make a gap in the middle. In this gap we will insert the long strip of whole flowers. Now again we have a shawl. We could stop now if we wanted, but it lacks a border! This is where the half flowers come. Instead of crocheting a scalloped border (which would be much easier, if you ask me), the designer has made scallops by using half flowers, which you have to stitch to the border of the shawl, that is the two short sides coming together as a point. Is that clear now? I think the confusion comes from a mistake in the pattern. It says, about the border: "Sew each of the half-flowers along the long sides of the triangular pieces" It should say along the SHORT sides of the triangular pieces. Because she just told us that the long sides go on top, and the top has no border, of course! Hope that helped. By my calculations, 1000 yards at 3500 yards per pound (ypp) would be about 130g of 100% superfine merino wool. 1000 / 3500 = 0.2857 454g x 0.2857 = 129.39g Hope this helps! Can anyone else tell me how much yarn you bought for this. The directions have 1000 yards Sample Henry"s Attic 2ply Pony, then 100% superfine merino wool, 3500 ypp. I would appreciate an explaination for this. Thank you for your quick response. I am making this for my daughters birthday. I'm totally confused, please explain the finish assembly #2 i cannot figure out how to assemble the flower to the panels. i'm looking at the pic but still can't figure it out. Thanks for your quick response. I'm making it as a gift! When you said,''ch3 (cout as 1dc), work 15 dc into ring'',rather ch3(counts as 1dc),work 15dc into ring,do you mean that I should work 15dc altogether,or just 15dc after the first dc-ch3?